This embroidery-only model is a perfect companion to your sewing machine. Online Owner's Class videos are included. Online Owner's Class Videos to help you get started. The Superb EM200 embroidery-only machine can be used by all embroidery enthusiasts! For the sewist, it's the perfect companion to your sewing machine. If you're just getting into the craft, you can add embroidery to store-bought items like towels, garments, table runners, napkins, gifts and much more. There are 200 embroidery designs included, as well as 6 alphabet options so you can add lettering and monograms to personalize projects. If you need a little assistance, there is an online Owner's Class Video available whenever you need it. Embroidery Designs Included (200)Personalize any project with a large selection of embroidery designs including floral, holiday, children's designs, and crosstitch. Embroidery Fonts Included (6)Embroider customized text such as monograms and fun phrases. Software Included (EM200) (+)Complimentary software is available at mysewnet.com for accessing additional designs and saving to a USB stick for tranferring to machine. Software also allows for resizing designs and combining designs to create design layouts. High Speed Stitching (700/min)Professional speed for faster results. Sewing Space (Needle to Tower) (7.8")The distance between the needle and the main part of the machine. 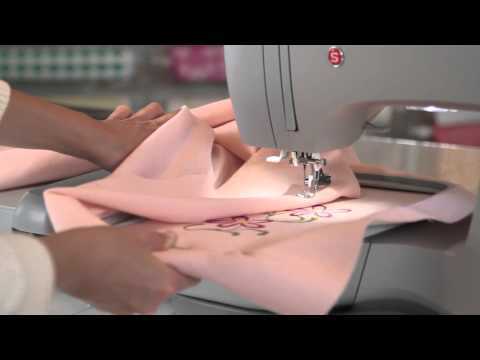 Having a generous "C" space allows you to sew larger projects like quilts with ease.